We are now one week away from Kentucky Derby 2015 and the participants are starting to assemble under the Twin Spires. The next few days will bring final workouts and post positions will be drawn on Wednesday. One Lucky Dane was injured in a workout last weekend and is off the Derby trail for Bob Baffert. Todd Pletcher’s Madefromlucky will not run in the Derby after an unsatisfactory workout at Churchill Downs on April 24. Keen Ice takes over the 20th and final spot with Frammento and Bold Conquest on the outside looking in. Latest Published Workout: 4f in :48 (5/76) at Keeneland on April 18. Last Start: 1st in G1 Blue Grass at Keeneland on April 4. Comments: He’s been part of my list since last September and has occupied the top spot for more than four months. He continues to prepare for the Derby at Keeneland and the feeling here is that we have not seen his best. Latest Published Workout: 5f bullet in :58.80 (1/59) at Santa Anita on April 18. Last Start: 1st in G1 SA Derby on April 4. Comments: The undefeated Derby contender elevated his game to new heights in back-to-back graded wire jobs in the San Felipe and SA Derby. The massive colt owns early-pressing versatility and cruised in his lone Churchill start. Latest Published Workout: 5f in 1:01.80 (35/60) at Churchill Downs on April 18. Last Start: 1st in G2 Louisiana Derby at Fair Grounds on Saturday, March 28. Comments: My original #1 ranked Ky Derby contender when I started this list Sept. ’14. The very experienced Derby contender began his career last June. He keeps getting better but needs further improvement to make a splash on the first Saturday in May. I love his professionalism. Last Start: 1st in the G1 Arkansas Derby. Comments: The 2YO Champ did not break a sweat in the Rebel or Arkansas Derby and the Kentucky Derby favorite was an early arrival at Churchill Downs. Latest Published Workout: 5f bullet in 1:01.35 (1/7) at Palm Meadows on April 16. Last Start: 1st in G1 Wood Memorial at Aqueduct on April 4. Comments: He’s the fourth member of my original list from September and I played him Derby Future Pool 1. He showed a new closing dimension in the Wood Memorial and will do the bulk of his Kentucky Derby preparations in Florida. Latest Published Workout: 5f in 1:00.19 (3/16) at Belmont Park on April 19. Last Start: 3rd in G1 Wood Memorial on April 4. Comments: The 5th and final member of my original Derby list. Nothing bothers the versatile, consistent sort and he certainly brings plenty of experience to the table. He was reportedly energetic in his Belmont Park workout on April 19. Latest Published Workout: 5f in 1:00.40 (22/59) at Santa Anita on April 18. Comments: After two grueling defeats to Dortmund, he cruised to a very easy win at Sunland. The Kentucky Derby will be his first start in six weeks. Latest Published Workout: 4f bullet in :47.40 (1/6) at Palm Meadows on April 17. Last Start: 2nd in G1 Florida Derby on March 28. Comments: Spiked a fever and missed his workout last week but looked good returning to the worktab April 17. Trainer: Todd Pletcher – Owner: Alto Racing, LLC. Latest Published Workout: 4f in :48 (7/78) at Churchill Downs on April 24. Last Start: 1st in G1 Florida Derby at Gulfstream Park on March 28. Comments: The last unraced 2-year-old to win the Kentucky Derby was Apollo in 1882. He earned a 110 BSF in the G1 Florida Derby and looms a pace player on the first Saturday in May. Latest Published Workout: 5f in 1:02 (7/20) at Churchill Downs on April 22. Last Start: 3rd in G2 LA Derby on March 28. Comments: Hard-knocking gelding earned his way into the Kentucky Derby with a 2nd in the G3 Lecomte, another 2nd in the G2 Risen Star, and a 3rd in the G2 LA Derby. Latest Published Workout: 3f in :36.20 (1/2) at Arlington Park on April 21. Last Start: 1st UAE Derby. Comments: The Irish-bred mystery horse is traveling across the globe for a shot at Derby glory. Trainer Mike de Kock is one of the best in the world. American Pharoah is the Kentucky Derby 2015 favorite following another facile win in the Grade I Arkansas Derby at Oaklawn Park on Saturday, April 4. American Pharoah did not control the pace this time. Instead, he allowed overmatched longshot Bridget’s Big Luvy to scoot away early. American Pharaoh inhaled the speed and coasted home by eight lengths under a hand ride. The Kentucky Derby favorite arrived at Churchill Downs earlier this week. He got a late start this year and the Derby will be his third start in seven weeks. Comments: He’s been part of my list since last September and has occupied the top spot for more than four months. The feeling here is that we have not seen his best. Latest Published Workout: 4f in :49 (7/9) at Churchill Training on April 11. Comments: The 2YO Champ did not break a sweat in the Rebel or Arkansas Derby and heads to Churchill Downs as the Kentucky Derby favorite. Comments: The 5th and final member of my original Derby list. Nothing bothers the versatile, consistent sort and he certainly brings plenty of experience to the table. Latest Published Workout: 5f in :59.20 (5/56) at Santa Anita on April 11. Last Start: 2nd in G1 SA Derby on April 4. Comments: His sire Lookin at Lucky was my Kentucky Derby horse in 2010 and his son qualified for the Derby with a smart runner-up finish behind stablemate Dortmund in the SA Derby on April 4. Latest Published Workout: 4f in :48.50 (4/15) at Palm Beach Downs on April 11. Latest Published Workout: 4f in :49.40 (12/18) at Churchill Downs on April 15. Shared Belief tries to run his impressive career record to 11-for-12 in Saturday’s Grade II Charles Town Classic. Charles Town is a unique six furlong bullring oval and the nine furlong showcase will be run around three turns. This will be a new experience for Shared Belief but he has handled everything with ease throughout his career. Eight horses will square off against Shared Belief including G1 winner Moreno. The latter was 3rd in the 2014 Charles Town Classic and should make his presence felt throughout. 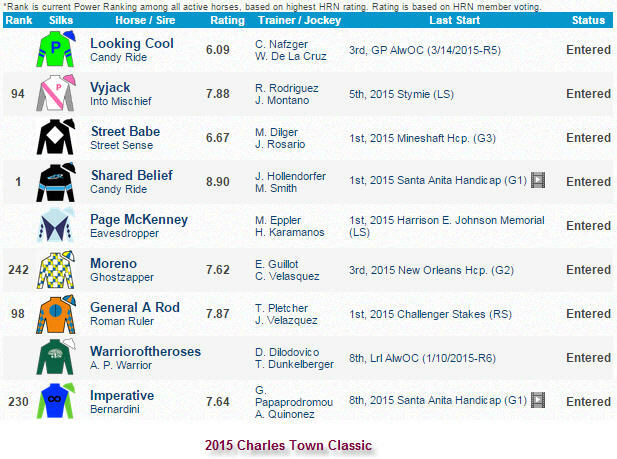 2014 Charles Town Classic hero Imperative is back to defend his title but his recent form is suspect. Fans might remember General a Rod from the 2014 Triple Crown series. He is now trained by Todd Pletcher and exits a romping score in the Challenger Stakes at Tampa Bay Downs. Lightly raced Street Babe exits a smart win in the G3 Mineshaft. He has plenty of upside but lacks the necessary seasoning to win a race like this. G2 Kelso winner Vyjack appears most effective in extended sprints around one turn. Gem of consistency Page McKenney shoots for a hat trick but has never faced rivals this tough. Looking Cool was claimed out of his last for $62.5k and will try to get involved late. Longshot Warrioroftheroses should show speed. Arkansas Derby favorite and Eclipse Champion American Pharoah completes his Kentucky Derby 2015 prep campaign at Oaklawn Park on Saturday. American Pharoah was the controlling speed in the G1 Del Mar Futurity, G1 FrontRunner, and G2 Rebel Stakes, and it might be déjà vu all over again in the Arkansas Derby. The G3 Coolmore Lexington Stakes has minor qualifying points attached but none of the entrants are seriously considering the Kentucky Derby. There are a few promising runners worth following, including my top choice #3 COMFORT (5-1). His first two turf routes were not great but he looked like a new horse in a facile two turn maiden win on the Fair Grounds main track. He was purchased privately by Eclipse Thoroughbred Partners and is now trained by Todd Pletcher. He fired a Florida bullet last month and looks ready to roll off the shelf under Javier Castellano. #7 Donworth (5-1) overcame trouble to beat twelve rivals in his extended sprint bow at Gulfstream Park. Motion chose this over an easier allowance spot and he’s bred to be a quality two turn performer (Tiznow-Street Cry). He has raw talent but lacks seasoning. #5 Fame and Power (5-2) put it all together vs. four foes in his fifth lifetime start at Santa Anita March 8. The Juddmonte-Baffert runner should make his presence felt from the outset. #1 Divining Rod (3-1) was 2nd in the G3 Sam F Davis and 3rd in the G2 Tampa Bay Derby. He’s an inside pace factor. #4 Tiznow R J (5-1) lost his way after finishing a solid 3rd in the G3 Lecomte. #3 Quimet (8-1) dons the hood after getting dusted in the G1 Florida Derby. #5 Henry Jones (6-1) stretches out and looms a pace player for D. Wayne Lukas. G1 Wood Memorial (103 BSF): Frosted rebounded in a big way while racing wide and rallying to a convincing win under new pilot Joel Rosario. Tencendur was a surprising 2nd and El Kabeir chugged along for the show. Beaten favorite Daredevil has been sent to WinStar Farm for a freshening and is expected to target the G1 King’s Bishop at Saratoga this summer. G1 Blue Grass (95 BSF): Carpe Diem was a complete standout in the paper race and did not disappoint on the racetrack in virtual replay of his Tampa Bay Derby triumph.Danzig Moon finished 2nd and Ocho Ocho Ocho bounced back with a respectable show finish. G1 SA Derby (103 BSF): Dortmund basically repeated his San Felipe wire job over many of the same rivals and late blooming stablemate One Lucky Dane to keep his perfect record intact. Bolo collected the show and 4th place finisher Prospect Park had an elevate white blood cell count this week and is no longer under consideration for the Kentucky Derby. Comments: He has done little wrong in his career and the best is yet to come. He’s been part of my list since last September and is one of only two that occupied my Number 1 spot, the other being International Star. Comments: The hits just keep on coming for Baffert’s undefeated colt. In his last two wire jobs he did not face Firing Line, the only horse to challenge him, and that one romped in the Sunland Derby a few weeks ago. The massive colt owns early-pressing versatility and cruised in his lone Churchill start. Comments: My original #1 ranked Ky Derby contender when I started this list Sept. ’14. He keeps getting better but needs further improvement to make a splash on the first Saturday in May. I love his professionalism. Latest Published Workout: 6f bullet in 1:11.60 (1/25) at Santa Anita on April 5. Comments: He has also been part of my list since the beginning. Controlled the pace in all three of his graded wins and is back at Oaklawn for his final Derby prep in Saturday’s G1 Arkansas Derby. Comments: He’s the fourth member of my original list from list September and I played him Derby Future Pool 1. The Wood was a huge step forward and he is peaking at the right time. Comments: The 5th and final member of my original Derby list. The versatile, consistent sort has been in steady training throughout his career and never seems to miss a beat. Latest Published Workout: 4f in :48 (12/40) at Santa Anita on April 3. Comments: After two grueling defeats to Dortmund, he cruised to an effortless tally in New Mexico and had his first Kentucky Derby workout earlier this month. Comments: Gem of consistency might appreciate getting away from the demanding Gulfstream Park surface. Comments: Last year’s 6th place BC Juvenile finisher jumped into the Derby fray in a hurry this season with a smart Optional Claiming win March 19 and a runner-up to stablemate Dortmund in the SA Derby on April 4. Comments: The last unraced 2-year-old to win the Kentucky Derby was Apollo in 1882. Comments: Hard-trying gelding qualified for the big dance with a 2nd in the G3 Lecomte, another 2nd in the G2 Risen Star, and a 3rd in the G2 LA Derby. Santa Anita Derby favorite Dortmund makes his final Kentucky Derby 2015 trail prep start and tries to stay unbeaten on Saturday at Santa Anita Park. Dortmund has already qualified for the Kentucky Derby on points but his main rivals have not so look for Prospect Park, Bolo, and One Lucky Dane to put everything on the line at the Great Race Place. 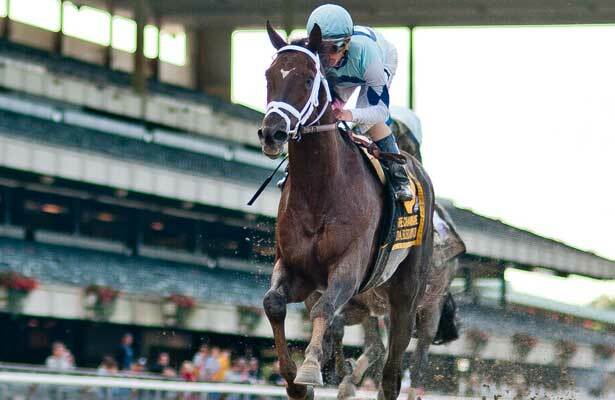 The G1 Wood Memorial features NY lover El Kabeir vs. Florida shippers Daredevil and Frosted. #4 FROSTED (5-2) looked like he was on his way to a facile victory in the FOY but he inexplicably came to a stop in the stretch. The Gulfstream Park main track was very strange on the FOY and Florida Derby Day and McLaughlin did the right thing getting out of dodge. He is proven at Aqueduct, switches to Rosario, and might bounce back in a big way. He’s my top selection. #6 Daredevil (9-5) loves the Belmont goo and clearly relishes one turn races. He has put up some big numbers but only has one start at seven panels in 5+ months and must prove himself around two turns. #5 El Kabeir (3-1) owns running style versatility and always runs his race. He will be there to pick up the pieces if Frosted and-or Daredevil stub their toe. #1 Tiz Shea D (8-1) has a ton of upside and sports a strong pedigree but I am expecting much more from the lightly raced G3 Gotham runner-up later this year. The Wood Memorial field is completed by outsiders #2 Toasting Master (20-1), #3 Lieutenant Colonel (15-1), and #7 Tencendur (12-1). A final note about the Wood Memorial. Far From Over was originally pointing to the Wood but came up with an injury and is off the Derby trail. G1 Florida Derby (110 BSF): Materiality ran his record to 3-for-3 with a solid win over Upstart but I am not buying the inflated speed figure. Upstart had his number taken down in an ugly renewal of the FOY and I was not impressed with the stretch run of the Florida Derby either. The Gulfstream Park main track was odd to say the least and I do not know what to make of the Kentucky Derby contenders exiting that oval. G2 Louisiana Derby (98 BSF): International Star completed a sweep of the two turn graded Derby preps at Fair Grounds with a determined, hard fought win over Stanford in the LA Derby. War Story finished 3rd. Latest Published Workout: 4f in :47.98 (3/19) at Palm Beach Downs on March 28. Comments: He looks like a complete standout in the G1 Blue Grass Stakes at Keeneland on Saturday, April 4. Latest Published Workout: 6f in 1:11.60 (3/31) at Santa Anita on March 28. Comments: After back-to-back grueling efforts, he got a much needed easy wire job win in the San Felipe. He is the strong G1 SA Derby favorite. Comments: My original #1 ranked Ky Derby contender when I started this list Sept. ’14. He keeps getting better but needs further improvement to make a splash on the first Saturday in May. Latest Published Workout: 5f in :58.60 (2/88) at Santa Anita on March 29. Latest Published Workout: 5f in 1:01.12 (2/28) at Belmont (dirt training) on March 30. Comments: Gem of consistency exits the baffling Gulfstream Park Ky Derby prep series. Latest Published Workout: 5f in 1:00.45 (2/15) at Palm Meadows on March 29. Latest Published Workout: 4f in :48.45 (23/89) at Belmont (dirt training) on March 29. Last Start: 2nd in G2 Swale at Gulfstream Park on March 7. Comments: He is the Wood Memorial favorite but still has some questions to answer Saturday. Latest Published Workout: 5f in 1:01.20 (46/83) at Santa Anita on March 28. Comments: Rapidly improving colt finished well for the place in the San Felipe. He is training well for the SA Derby.